Kathy Scott takes over 300 documents from the Everett Garrison archives and transforms them into the human side of a genius craftsman who “set into motion a rod-making renaissance”. Kathy Scott, in her own unique style, has done it again! In The Letters to Everett Garrison, Kathy has taken over 300 documents from the Garrison archives and transformed them into another one of her “Good Reads”. In this first time glimpse into to the life of a craftsman who “set into motion a rod making renaissance” Kathy Scott enables the reader to view the human side of the Garrison genius. As a neophyte rod maker I struggled for years to make a split cane rod using the Master’s Guide. Misters Garrison and Carmichael penned a tome of numbers and formulas, procedures, practices and painstaking perfection. At first I was frustrated but as I grew accomplished in the craft I joined the ranks of those who respected and aspired to Mr. Garrison’s ability and marveled at his science and insights. 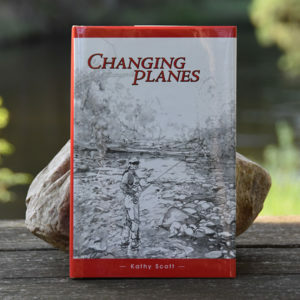 Kathy Scott in “Letters” captures the soul of those who treasured his workmanship, valued his tapers and found a kindred spirit in the man who made rods but also went fishing. If you are addicted to “rent cane” or its history you will enjoy “The Letters to Everett Garrison” by Kathy Scott. Like a vintage, Garrison 212E, this book will become a treasure! Stories are like split bamboo fly rods, they should be taken out every now and then to appreciate their history, craftsmanship and beauty. Kathy Scott in “The Letters to Everett Garrison” has given us a story about bamboo fly rods and one of the crafts preeminent rod makers. It’s a wonderful story that will live forever. 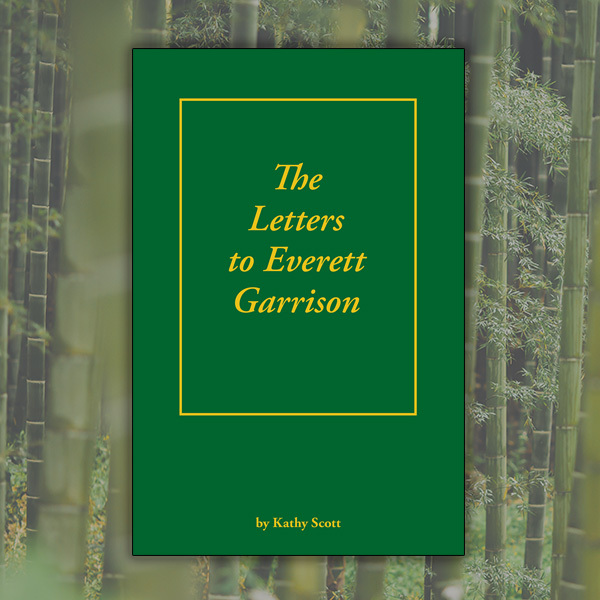 In “The Letters to Everett Garrison” Kathy Scott skillfully assembles considerate inquiry, thoughtful reflection and glowing praise to legendary rod maker Everett “Gary” Garrison. Unfolding like a story this compilation reveals the mutual esteem folks shared for a true master of split cane and the special fly rods he built for those who admired his work. In a time of electronic communication and composite fly rods there is a strong parallelism between old fashioned letters and a rod made from split bamboo. “The Letters to Everett Garrison,” compiled by Kathy Scott, remind us that Mr. Garrison’s fly rods were fished, broken, fixed again, and treasured by anglers. 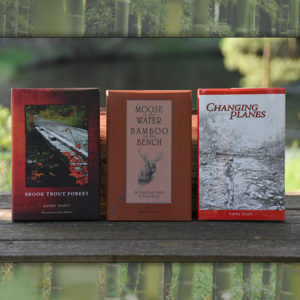 Purchase three books by Kathy Scott at a special low price. You’ll get three rods, three reads, three adventures. In Changing Planes, Kathy Scott takes plane in hand, learning the craft from her husband, David Van Burgel, an experienced, highly talented, rodmaker. The nature of change, the changes in nature, and the inspirations of community are intertwined in the resulting engaging journal of their lives together. 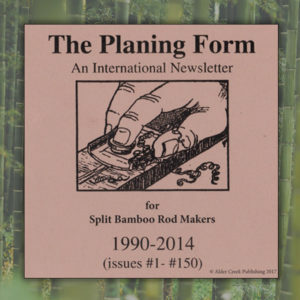 Now available — a DVD with all 150 back issues of The Planing Form (years 1990 to 2014). More than 1,500 pages of rod making history by dates, titles, authors, tapers, ads and places/events!